These steaks were so delicious, juicy and evenly cooked. Sous vide is a really exciting method to explore as a home cook. Season steaks to taste with salt, pepper and a small amount of garlic powder. 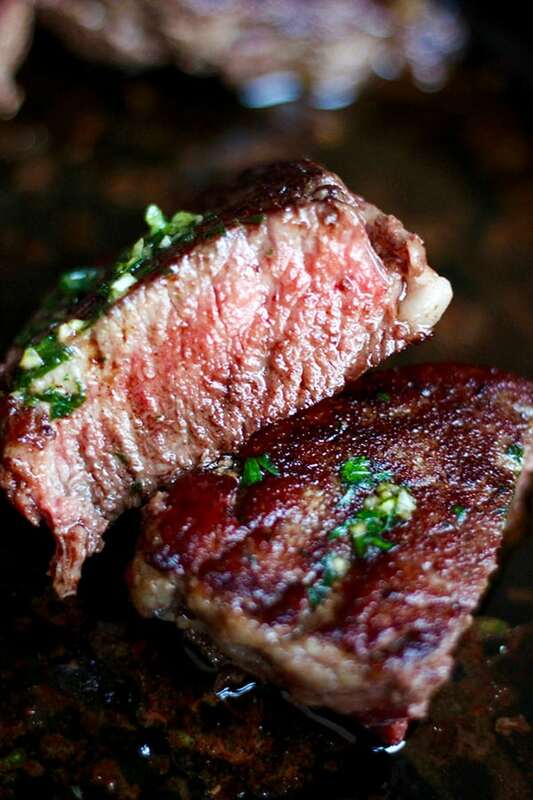 Heat Sous Vide to temperature based on preference of doneness, from rare, medium-rare or medium. Refer to chart in directions for temp and time guidelines. If preference is medium-rare, heat water bath to 130 degrees to account for increase in temp during final searing and set timer for one hour. When water is heated, submerge steaks in plastic storage bag and seal. While steaks are cooking, prepare garlic butter. Mix softened butter with minced garlic, pinch of salt and parsley. Remove steaks from water bath after one hour. Heat cast iron skillet over high heat with 1-2 tablespoon of olive oil. Once oil is smoking, quickly sear steaks on each side. 30 second to 1 minute per side. Top steaks with butter compound, let rest and serve.